In the world of arbitrary competition, a contest originally set up in 1980 finally has a winner. 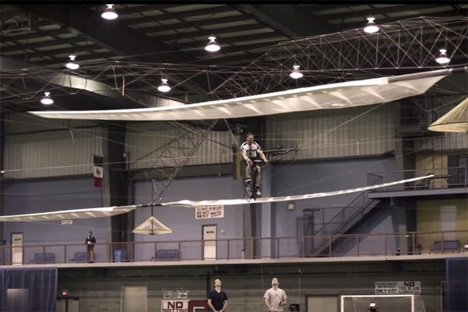 The focus: man’s first successful controlled flight of a human powered helicopter. And no, the year it started was not supposed to be 1480. 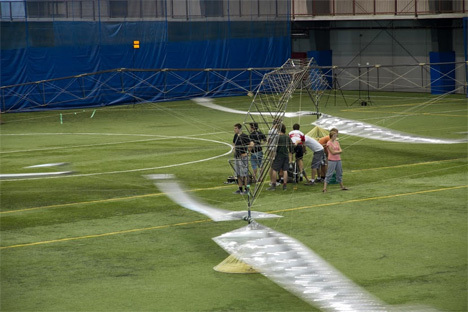 The winning team of the AHS Igor I. Sikorsky Human Powered Helicopter prize was AeroVelo, a group of Canadian engineers. To take home the $250,000 prize, the team hovered at a height of around ten feet for around a minute. Those aren’t terribly impressive stats, but the feat of engineering accomplished has had competitors baffled for more than 30 years. Atlas, the winning machine, has a wingspan of about 155 feet but weighs only 120 lbs. Team leader Todd Reichert and chief engineer Cameron Robertson plan to keep building flying machines for a company they recently started. Leonardo da Vinci would be proud. See more in Concept Vehicles or under Transportation. July, 2013.